Annette Day’s entire film career consists of her single appearance with Elvis in Double Trouble. After that she retired from films and never went back again. 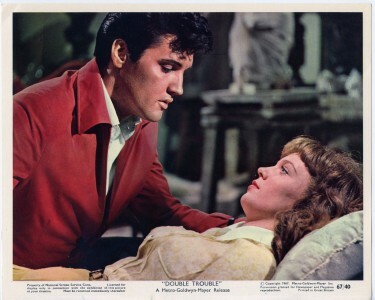 Just over half a century ago Annette Day was filming Double Trouble with the King of Rock ‘n’ Roll. When she heard the news that Elvis had died she was living in Beckenham. Annette, who now lives in Telford, Shropshire, knew about this better than most. Because 10 years earlier, as a fresh-faced 19-year-old, Annette became the first and only English actress to star alongside Elvis on the big screen. The 69-year-old grandmother played Jill Conway, a rebellious British heiress who led the singer through all sorts of wild escapades across Europe, getting mixed up with spies, jewel thieves and madcap detectives along the way. 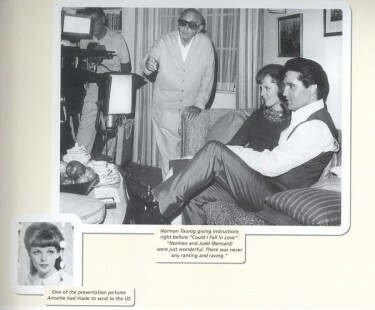 Off screen, the pair enjoyed a close, if brief, friendship with the King of Rock ‘n’ Roll, which even extended to him buying her a car as a treat. It is 40 years today since Presley died in the bathroom of his Gracelands mansion in Memphis, Tennessee, after suffering from heart failure brought on by a drug overdose. He was just 42 years old and, if not at the height of his stardom, was still one of the biggest global stars having successfully reinvented himself for the glam rock era. While there had been rumours about his health, particularly concerning his weight and dependency on prescription drugs, very few people were aware of the lonely, troubled individual behind the flamboyant jump-suited stage persona. 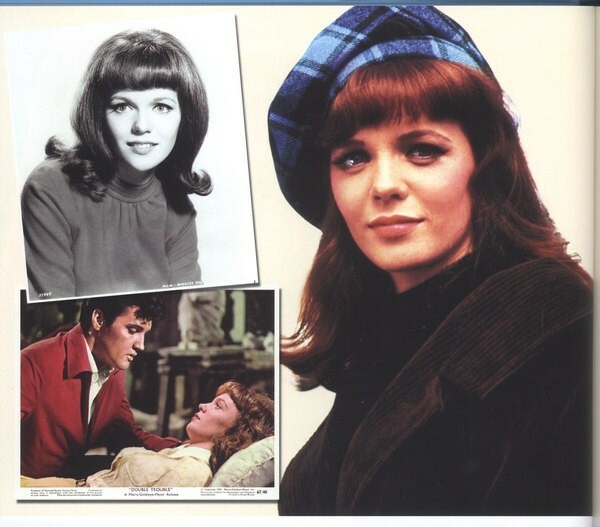 Annette, who settled in Shropshire with husband Mike the year after Elvis’s death, remembered the singer as being like a big brother to the innocent teenager who had been plucked out of obscurity after being spotted working on a market stall by film producer Judd Bernard. “He had a terrific sense of humour, he was always playing games,” she says. And she got a first-taste of the star’s legendary generosity at the end of filming, when she was making small talk about how youngsters back in Britain would have to save to buy their first car. “After a day on set we were talking about how youngsters have to save every penny to buy a car after their graduation,” she says. Then one day, in a car park, Elvis asked her to follow him, and asked her to close her eyes. “At that moment I knew he had a surprise waiting for me, but never in my wildest dreams could I have thought of a sports car,” she says. “It was a white Mustang convertible. Elvis handed me the keys and said ‘it’s your’s’. 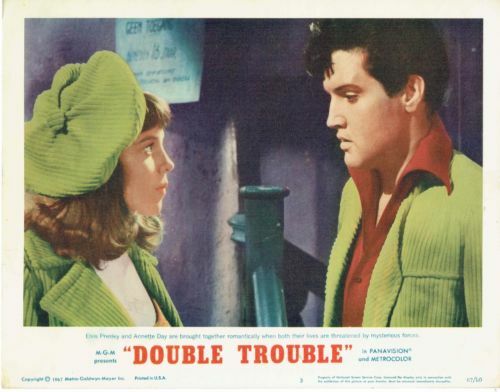 Double Trouble was Presley’s 24th feature film, and it was reported that by this time he was getting quite weary of them, although he made seven more movies in the two years that followed. 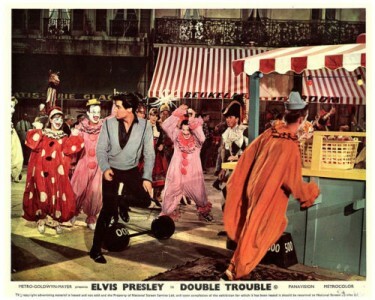 It is said that when he found he would have to sing Old MacDonald Had A Farm for a scene in Double Trouble, Elvis screamed “It’s come to this?”, and Annette believes that he was definitely falling out of love with the movie industry. “I think, more than anything, he wanted to be back out on stage to his fans,” she says. Annette, who worked as a secretary at Telford-based SMP Security before her retirement, was offered a seven-year contract by MGM Studios after Double Trouble, but decided acting wasn’t for her. She rarely talks about her part in the film, and reckons many people have no idea about her previous career. “I don’t watch the film very often, and when I do I don’t think I was very good in it,” she says. She returned to the UK, not only leaving behind her brief film career, but also her Ford Mustang. “I found it would cost rather a lot to bring it back to the UK,” she says. Today, of course it would be worth a fortune as a treasured piece of movie and musical history, but she gave it to her brother who was living in the US at the time. He used it for a few years, and then sold it when it broke down. It all begs the question of what would Elvis be doing if he were still alive today at the age of 82? Annette does not think he would be performing today, although she say s he would also have found it very difficult to give it all up. “It must be very hard for somebody who is at the top like that to walk away from it all,” she says. And she has no doubt that if he had lived to a ripe old age, it would have done nothing to lessen the legacy of his work. “He just had something about him,” she says.